These are built from a stainless steel plates pack with no gaskets and welded together by copper brazing in a vacuum furnace. 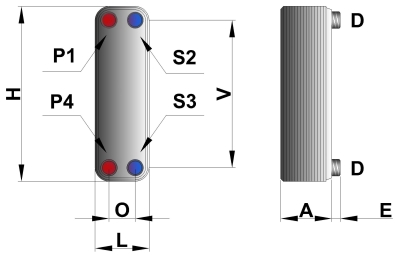 The selection of the most suitable model and corrugation for the requested application is made by our technical staff using a calculating software. 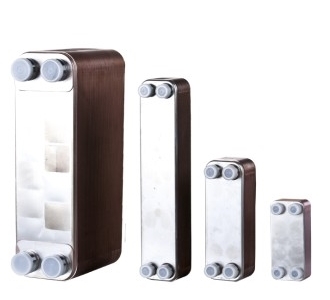 All our brazed plate heat exchangers are 1-pass and operate in parallel flow. They can be used both for heating and chilling, using any kind of water also with glycol. For the verification of compatibility with other fluids contact our technical office. Accessories - External removable insulation, in non-flammable and anti-diffusion expanded polyurethane, available with or without external finishing in coloured polystyrene. P1-P4-S2-S3 Ø 3/4" 1" 1" 2"